How steep are your curves? I have been in my new job for four months now, and the learning curve has been steep … Wait a minute. What has the learning curve been? I never understood the expression “a steep learning curve”. When people say “a steep learning curve” what they mean is that something is difficult to learn and requires a large amount of effort (typically at the beginning). 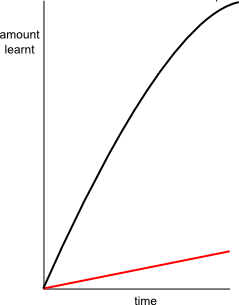 But presumably a learning curve plots the amount of whatever it is you have learnt on the y axis and time or effort or something similar on the x axis. So really, when we say “it’s a steep learning curve” what we mean is “it’s a flat learning curve”. Let me rephrase my opening sentence: I have been in my new job for four months now, and the learning curve has been flat. The problem with that is, it really sounds much less dramatic. Or maybe what we actually have in mind is a plot that shows the amount we need to learn (e.g. in order to do our new job) on the y axis and time on the x axis. Then “a steep learning curve” means we need to learn a lot in a short time, and that means we have to put in a lot of effort. That kind of makes sense. Then again, maybe it shouldn’t be called a “learning curve”. Let me rephrase my first sentence: I have been in my new job for four months now, and the curve of what I’m supposed to be learning is quite steep. Or maybe I should stop being so nit-picky. By the way, there is another problem with assessing how steep a learning curve is, especially if you are a beginner: The Dunning-Kruger effect. Basically, if I am just starting out in a new field, I have no means of understanding what the field is. Let’s say, I am starting out with pole vaulting. Or maybe that’s not a good example. Let’s say flower arranging. Failing to understand the complexities of flower arranging, I might think that my own flower arrangements are actually quite nice. Also, when looking at a work from an expert flower arranger, I might not recognise how good it is (and how much better it is than mine). The title of Kruger’s and Dunning’s original paper on the phenomenon sums up my position in the world of flower arranging quite nicely: Unskilled and unaware of it). Then again, if I spend some genuine time and effort at learning how to arrange flowers and really get better at it, I will recognise how little it is I really know. Also, I will become better at recognising genuine expertise (and maybe this is a good time to go back to the expert flower arranger from the last paragraph and apologise). So, someone who is just starting out in a new field is really not in a good position to judge what the learning curve actually looks like. So maybe we should be very quiet about it. Let me rephrase my first sentence: I have been in my new job for four months now, and I am being very quiet about my learning curve. By the way, while writing this, an interesting sports science/psychology/educational research project has just occurred to me. The Dunning-Kruger effect was originally demonstrated to exist in the fields of grammar skills, logical reasoning, and even humor. I can well imagine it to exist in similar fields, such as … flower arranging. But maybe there are fields where there is no Dunning-Kruger effect. I am thinking, specifically, of pole vaulting. Surely, if you are bad at it, it will be painfully (I mean literally painfully) obvious. (As one olympic pole vaulter once said in an interview: “Training is hard, because you don’t always land on the mat.”) The learning curve might be flat, but the fall is steep. This entry was posted in Uncategorized and tagged Education, Language, Learning by melamelachan. Bookmark the permalink.